He never really cared about economic populism in the first place. 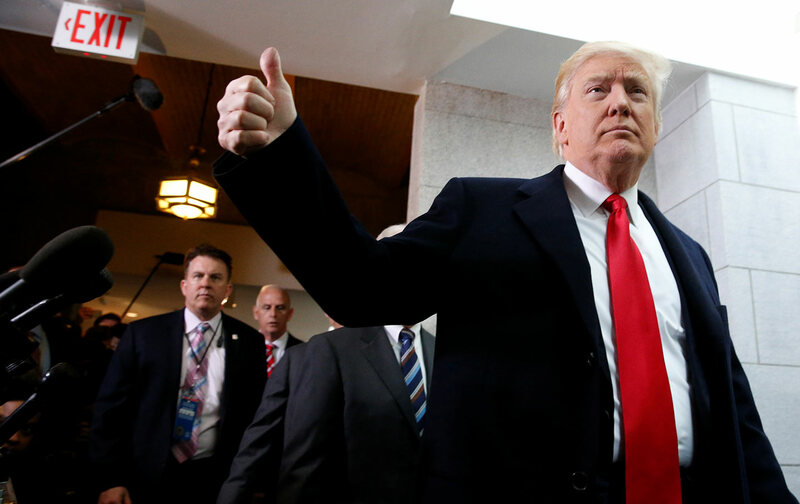 In his first 70 days in office, President Donald Trump is shedding his most popular, populist economic promises with the ease of a confidence man. After all of Trump’s bold talk on trade, his new commerce secretary, Wilbur Ross, suggested that the administration’s promised renegotiation of NAFTA will be based on the concessions that Canada and Mexico had already made to President Obama in the Trans-Pacific Partnership agreement. On health care, Trump discarded his promises of “health insurance for everybody” with lower costs and much better care. Instead, he embraced House Speaker Paul Ryan’s bill, which featured tax cuts for the wealthy paid for by depriving millions of coverage. Trump promised to “drain the swamp,” but he has turned his economic policy over to Goldman Sachs alums and packed his White House staff with lobbyists and cronies stained by corruptions and conflicts of interest. His proposed budget slashes domestic programs vital to his own voters’ interests in order to lard the US military with more money. Meanwhile, his popular criticism of regime change and endless wars in the Middle East has given way to continued escalation that will push the United States deeper into that region’s chaos. New York Times columnist Paul Krugman recently skewered Trump for “wimping out” on trade. According to Krugman, this was because Trump “had no idea what he was talking about” and is now discovering that the “deals aren’t all that unfair” and that trade is “deeply embedded in our economy.” But this argument is wanting—it lets Trump off the hook by saying he’s simply incompetent. In fact, this is a more fundamental betrayal of core values. Trump doesn’t truly want to renegotiate trade deals—either because he never really cared about them except as a talking point, or because he doesn’t want to upset the powerful corporate interests that benefit from them, or both. Progressives need to repeatedly expose these betrayals, not simply the gross stupidity and incompetence. Trump generates bedlam to distract from his broken promises and bad ideas, as he did during the campaign. The “chaos candidate,” as Jeb Bush dubbed him, presented himself as a populist champion who would clean out Washington. As Stan Greenberg affirmed in his focus groups, many of Trump’s voters doubted that he had the experience or the temperament to be president, but they wanted him to shake things up. Even those put off by Trump’s racism and sexism were attracted by his promises on jobs and trade, his scorn for Wall Street and corrupt politicians, and his pledge to “drain the swamp.” As president, he’s repeatedly promised an administration that would put the “forgotten working men and women” first. But the contrasts between the accomplishments of Obama’s clean and competent government—particularly in its first 100 days—and Trump’s circus are glaring. Trump is clearly intent on undoing as much of Obama’s legacy as possible, and he’s already making runs at health care, climate, abortion and family planning, Internet privacy, the Keystone and Dakota pipelines, the TPP, and Dodd-Frank and other financial reforms. That makes Trump look awful, though Democrats shouldn’t pretend that Obama’s presidency was the gold standard and simply turn this into a big argument about the two eras. Central to Trump’s victory was the legitimate anger of working people at the way the rules have been rigged by the political establishment of both parties. Inequality has reached obscene extremes, and workers’ wages have essentially been stagnant for four decades. After they helped to plunge the economy into the Great Recession, the bankers were bailed out, even as homeowners were abandoned. Our corporate-led globalization strategy has racked up ruinous trade deficits, with no strategy to deal with the job loss that devastated large regions of the country. Our endless wars without victory have squandered trillions of dollars and thousands of lives. The health-care system, even with Obama’s reforms, still prices millions out of adequate care, while costing more and delivering worse results than in other industrial nations. Our tax system is an open scandal, with billionaires still paying lower tax rates than their secretaries. Big money and special-interest lobbies corrupt our politics. Obama wasn’t the cause of all this, but he wasn’t the solution either. Workers of all races and genders have every reason to want to shake things up. Democrats will have difficulty consolidating a majority movement for change unless they understand this fundamental reality. Resistance can’t be about restoration; it must be about fundamental reform. There are a lot of sophisticated, experienced Clinton and Obama people wedded to defending the old order, and too many politicians and political operatives comfortable with the big-money power that corrupts our politics. That’s why progressive movements and standard-bearers must take the lead—both in exposing Trump’s betrayals and in showcasing new, innovative solutions. Bernie Sanders gets it right when he counters Trump’s failed and flawed heath-care bill with a renewed demand for Medicare for All. The Fight for $15 and the Movement for Black Lives are right to take to the streets together on the anniversary of Martin Luther King’s assassination with “Fight Racism; Raise Pay” actions demanding a $15-an-hour minimum wage and a union. Trump’s Supreme Court nominee, Neil Gorsuch, should be opposed not because Republicans stole the seat from Obama, but because he is an extreme right-wing judicial activist who consistently favors corporations over the rights of workers, women, consumers, and people of color. The Congressional Progressive Caucus is right to counter Trump’s retreats on trade not with the argument that deficits are inevitable or that NAFTA is working well, but with a bold plan to move to balanced trade. Our Revolution, People’s Action, MoveOn.org, Democrats for America, Credo, and others are right to build an independent capacity, fueled by small donations, to recruit, train, and run progressives who can challenge our corrupted politics and its compromised politicians. A peace-and-justice movement will be needed to challenge the endless wars and global policing embraced by the national-security elite of both parties. Trump’s betrayals come less because he is ignorant, and more because he never believed a word he said on the campaign trail. He is and always will be a con man. His faux right-wing populism can’t be answered with politics as usual. It must be answered with people’s movements and political leaders exposing the con and putting forth clear, bold reforms to make this economy work for working people.